Pom Pom Lace: Black Vintage Dress And Hot Red Shoes. Black Vintage Dress And Hot Red Shoes. Exams are looming and the end is in sight, I can taste the pure bliss of having three weeks off. No obligations. No homework. Just three weeks of free fun times! Yay I can't wait! 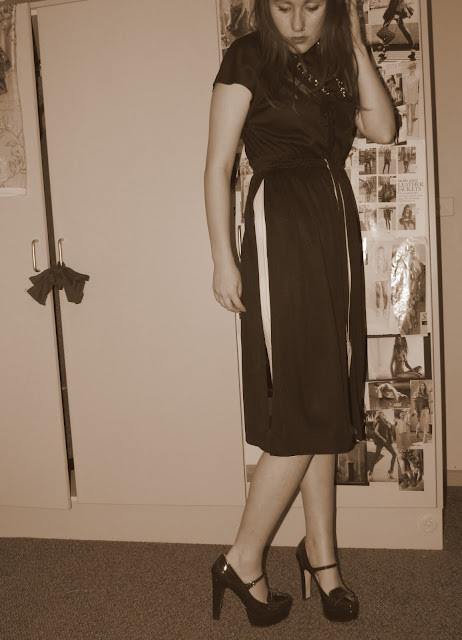 I found this dress a while back in a local op shop and recently found it hanging in my closet! Funny how you lose pieces of clothing in your wardrobe then WAM! Its like you just re discovered something beautiful that you forgot you had. Sometimes being forgetful is a blessing in disguise. These shoes from Wittner I just cant get enough of so I apologise in advance because you will be seeing them A LOT! Until I buy myself a pair of Jeffrey Campbells Litas these will be my heel of choice. They are shiny, tall and match my hair. What more can you ask for in a shoe?